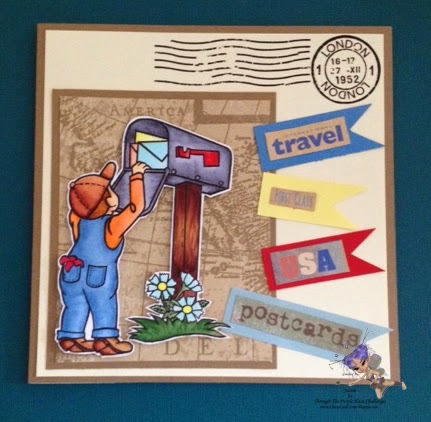 Joanie's Classy Card Corner: Special Delivery !! This little guy is standing on his tippy toes sending mail to some lucky persons. He's just adorable!!!! I used patterned paper from K& Company, "Sea Glass". The Postal Items are Rub-ons from October Afternoon, "Boarding Pass". It has been so very long since I used Rub-ons, but seen them hanging on the rack and said... woooo hoooo, just what I need. Well, I think that's about all I used and I think it came out pretty cute. I hope you think so too!! Now it's your turn to get your creation entered into the challenge and you could be the next lucky winner. And if you want to go shopping to get your perfect digi just give a click below and presto!!!! you're shopping!! I hope you find that perfect digi and START SCRAPPIN' TO MAKE IT HAPPIN"
Absolutely beautiful work......i love it..
what a lovely card Joanie....very wistful...a little boy sending a card to his grandma i expect. Love the colours you chose to use and well just love the card full stop!